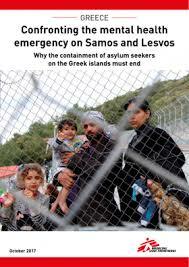 Medicins Sans Frontières (MSF) at least on Samos has sometimes been disappointing. In particular it was too often silent and should have used its influence and been more outspoken about the in-competencies of so many who are paid to care for the refugees. So it is refreshing to see their latest report on the mental health emergency engulfing the refugees on Lesvos and Samos. These are 2 of the islands where MSF are especially active and have had a lengthy presence. Without pulling punches MSF lays clear that refugees are being damaged and suffering unacceptable levels of stress by the way they are being treated and cared for on the islands. It is a system that is driving people mad. Anyone with even the merest contact with refugees on the island knows that they are being driven crazy. Waiting waiting for months. Little or no information. Promises never met. Dependent on often incompetent or overwhelmed officials. No control over anything in their lives. Boredom. Each month bringing further restrictions. Fear of deportation like an ever present shadow. Housing and food not fit for animals let alone refugees. What is stunning is not so much the mental health emergency discussed by MSF but the resilience and strength of so many that enables them to get through each day. Now that is stunning. As MSF point out 96% of the refugees on these 2 islands in 2016 and 2017 had directly experienced war and violence prior to their arrival. Yet on arriving in Europe there is no healing embrace but a system that deepens and worsens their well being. Consequently what little mental health provision there is here is simply overwhelmed. People wait between 3 and 6 months to see a psychiatrist. The hospital on Lesvos takes no new referrals. Mild conditions rapidly become more severe as treatment is delayed and the grinding daily realities of refugee life on the islands corrode well being. It is a responsibility of any organisation or individual working in the social domain to highlight and reveal emergencies. People have a right to know where, when and how policies are failing whatever the reason. It is a responsibility which has weakened in much of Europe as privatisation and neo liberalism has wiped out so many of the public services which once dominated the social domain of health and welfare. So it is refreshing to see MSF acting in this way. It would be wonderful to see rapid changes and improvements made in the light of this and similar reports. As this report was being published the head of the UNHCR in Greece was expressing alarm at the deteriorating conditions on the islands and the lack of preparation for the coming winter. But experience, at least on Samos, tells us that this report, like so many others before, will have no impact and that nothing will change for the better as far as the refugees are concerned. Instead, it will join the growing number of reports on the refugees which highlight the problems and cruelties and yet lead to no change. Why is this? Like so many reports of this kind which do try and speak truth to power, those in power often know only too well what is happening under their control. They may even find some ofthe critical reports useful in highlighting particular stress points that need some attention. Very high levels of self harm and suicide attracts unwanted attention for example. So it might lead to some changes but the fundamental problems remain. And the most damaging of these is that they don’t care about refugees as fellow human beings. This fundamental truth is evident in virtually every aspect of official refugee policy and practice in Europe today. How can care and compassion flourish in a framework dominated by containment and deterrence? Vast chunks of the so called refugee aid are now spent on surveillance technologies and systems, border hardening, air and sea patrols, and a growing array of security personnel. The mental health emergency for refugees on Samos and Lesvos is not due to a shortage of resources but how those resources are spent. As the years pass on Samos we are increasingly coming to the view that the authorities know and accept the massive anxieties and stress their policies produce and have come to embrace it as their main strategy of control. Reinforced it should be noted by arbitrary police punishments including administrative detention. On Samos it is common for the police to enter the containers early in the morning to remove so called trouble makers to the police cells as a punishment /warning. Firas a 17 year old boy from Syria told us that he had 2 nights in the cells because he spoke back to one of the police in the camp. And on Lesvos and Samos the police have launched mass pre-emptive raids in the camps over the past year involving hundreds of police to remind everyone who has the power. For authorities concerned not to see the camps explode into chaos, the perpetual anxieties, insecurities, and fears of the refugees compounded by their dire physical environment and sheer lack of information as to their cases, works in their favour. It significantly weakens the refugees and drains their energies making them easier to manage. The impact varies amongst the refugees depending on their individual circumstances, and some are more resilient than others. Not all are being crushed by the experience but many feel caught in an ever tightening vice. Other processes are also at work which individualise and hide what are collective concerns. Because no one knows why some refugees get processed more slowly than others, many feel that their delays are due to something they have done or said, something! but they don’t know what. And because you don’t know you keep your focus on your case. And of course you wait and wait. Hearing nothing and going slowly mad. Not surprisingly many turn their frustrations and anger inwards hurting themselves even more. It is fair to assume that MSF would hope that its Report will encourage change and make things better for the refugees. But for those in and with the power to do something? We doubt it will merit much attention and is even more unlikely to bring about any significant improvement. Without a fundamental re-orientation towards humanity and compassion there can be little hope for change. What grounds do we have to believe that those responsible for constructing and managing such a self-evidently inhumane system can ever be trusted or expected to do something different? The current system is a violation of humanity. This too is one of MSF’s conclusions, and can be found in endless official and semi official reports and inquiries into the refugees. It will for sure feature in future reports.